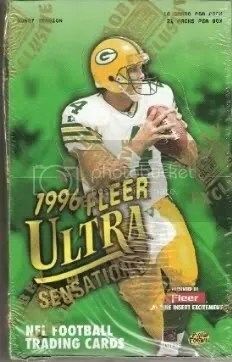 When I first started collecting, I can remember breaking so many packs of 1996 Fleer Ultra Sensations. At the time this product was released I usually only got my packs at either Wal-Mart or CVS. Each hobby box contains 24 packs with 10 cards in each pack. There are four different border colors to collect besides the basic gold cards from the base set: Blue, Marble Gold, Pewter, and Rainbow. I don’t think I have ever seen a Rainbow parallel from this product. 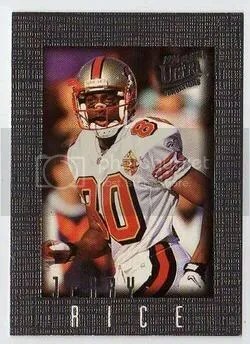 I think the rarest inserts that I ever pulled were a few Marble Gold cards. Of coarse, my favorite cards from this product are the Dan Marino cards. Sometimes the font that they used can be difficult to read, which results in K’s looking like H’s.